Can you believe Connecticut didn’t have a vegetarian and healthy living festival of some kind in the Hartford area until this year? Me neither! Although if you’d asked me a few years ago, I probably would have scoffed at the idea of attending such an event. Luckily my eyes have been opened to the wonderful world of my adventurarian lifestyle 😉 and even though I am not vegetarian or vegan, I still enjoy reading about other eating “lifestyles” and trying vegetarian and vegan foods. They are just as delicious as the rest! No bias here. After all, that’s what being adventurarian is all about. 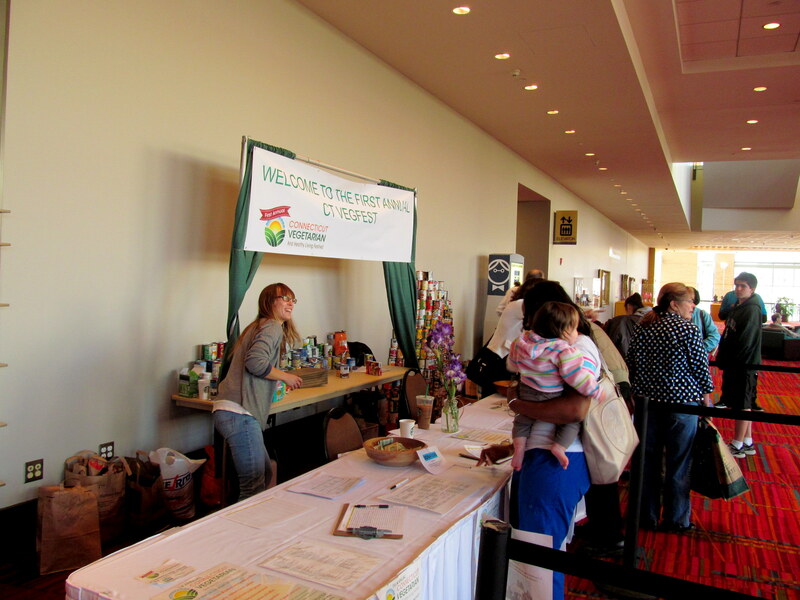 And that’s why I was beyond excited to attend the 1st Annual CT Vegetarian and Healthy Living Festival this past Sunday! Entry was free, but monetary or non-perishable food donations were encouraged, and it looked like a great turnout for both. I think that ideas for healthy living should be accessible for all, so Veg Fest organizers hit the nail on the head by making the donations optional. I donated money because I am able to do so, but those who cannot should still be able to attend something like this and learn about the options they have! I started out the event solo, but ended up meeting up with my blend Bethany and her sweet cousin Erica after they got out of the sessions they were attending when I arrived. Erica was awesome and even knows Jenn of She’s a Fit Chick, who was one of the first bloggers I ever discovered and is also an original founder of FitFluential! Small world. 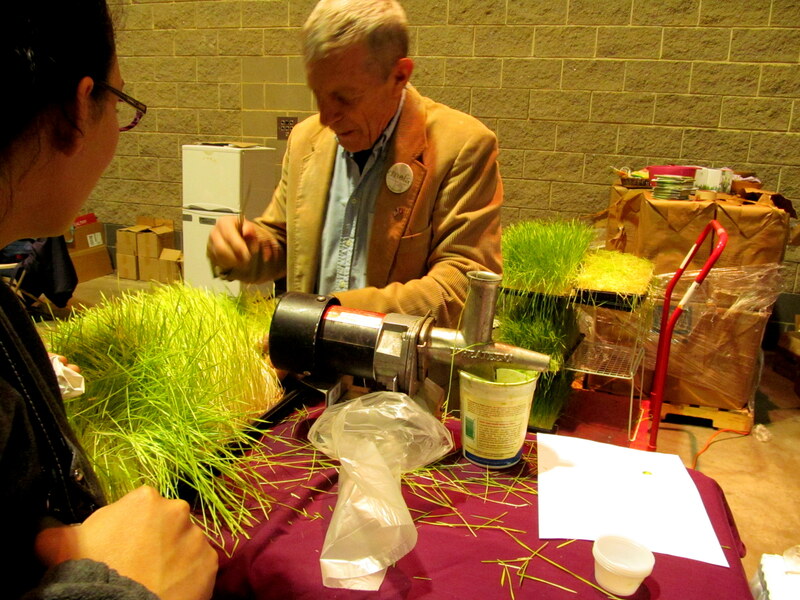 I knew I was in the right place (the CT Convention Center in Hartford, to be precise) when I walked in, looked to my right, and saw this guy grinding out fresh wheatgrass shots! 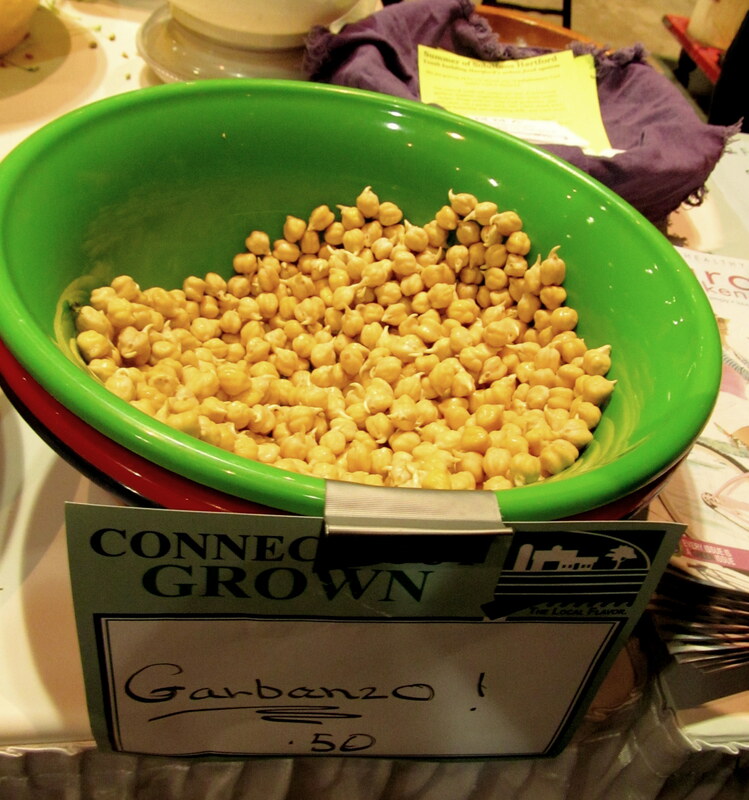 I didn’t even know CT grew chickpeas! 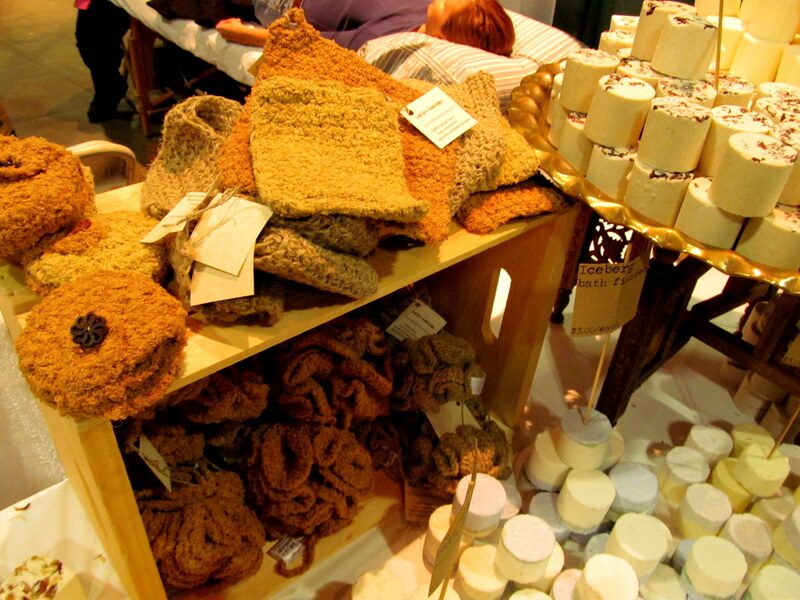 I am not a huge beauty product hoarder (lucky for me, though I do hoard plenty of magazines about them) so I didn’t spend too many time at the all-natural beauty product booths, but there were plenty of them. 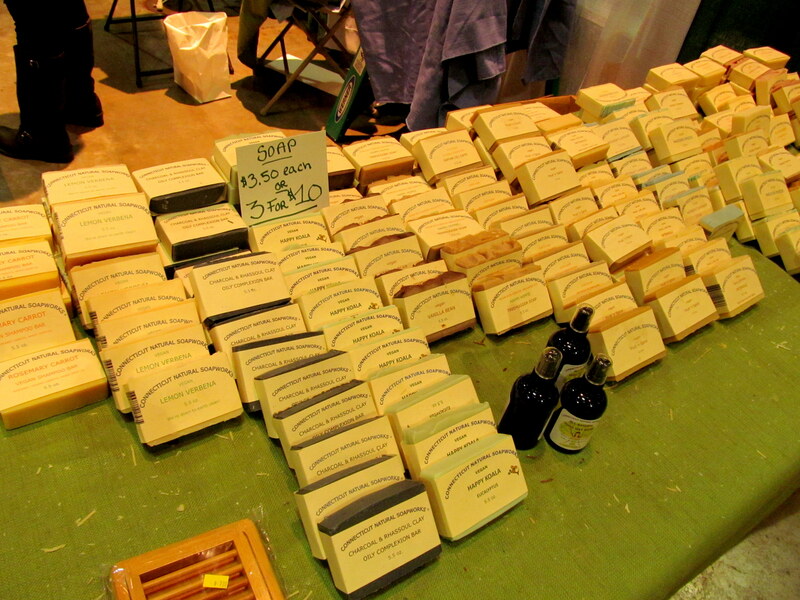 Soaps from CT Natural Soapworks. 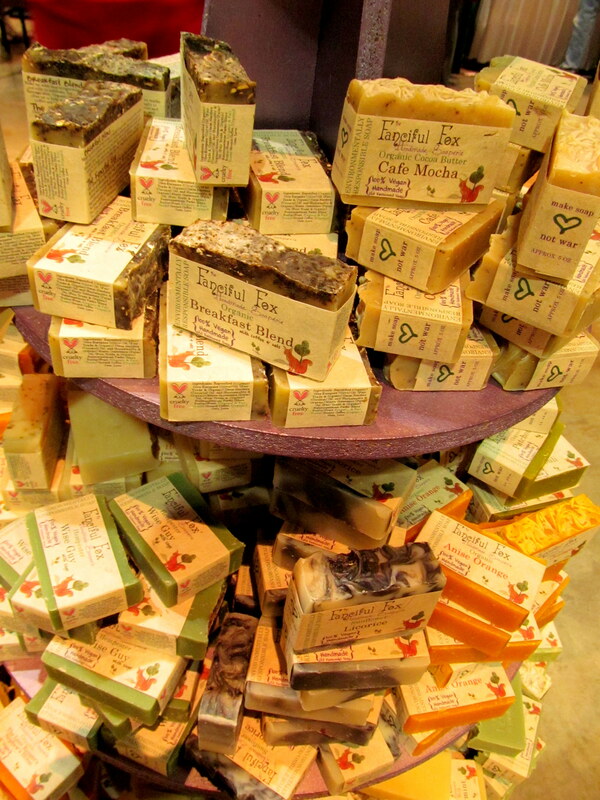 Tower of yummy Fanciful Fox soap flavors. The mother and daughter duo working this booth were handing out free soap “scraps”, so I got a piece of the green bar above, called Wise Guy. 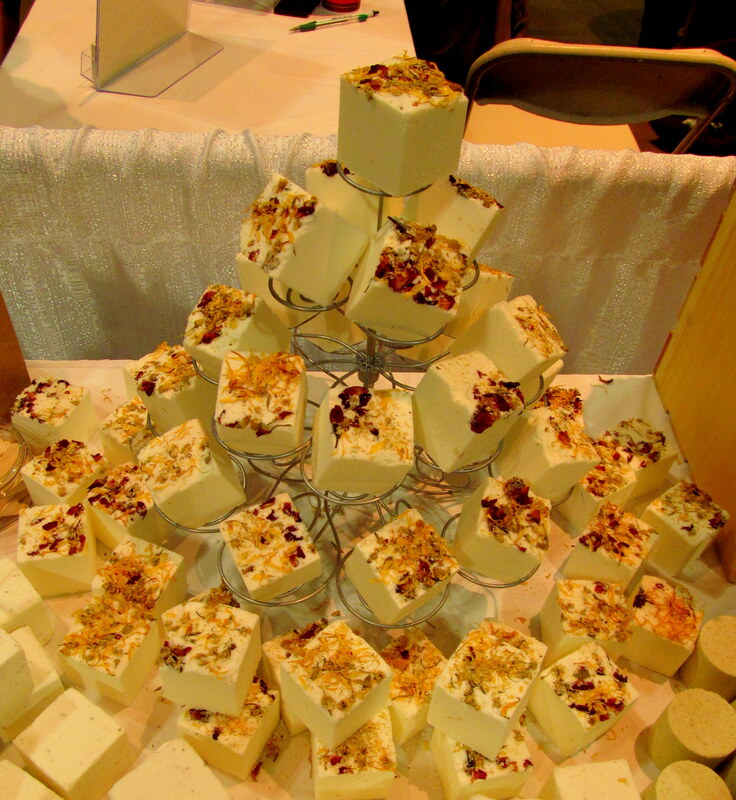 Soap doubling as a centerpiece?! Gorgeous! Just one variety of product offered by Hartford-based company Soul Purpose. 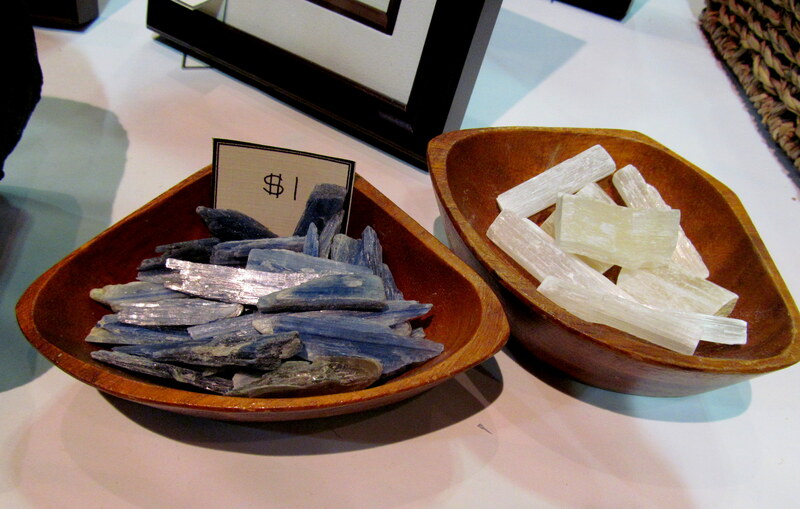 The small part of me that doesn’t have to be practical ALL the time paid $1 for one of the blue crystals below. The girl at the booth had so much faith in their ability to absorb only positive energy – I guess this specific kind is often used to clear negative energy from other crystals, that’s how many “good vibes” it carries. So I figured, why the heck not?! I tucked it into a pocket in my purse and have been carrying it with me since. 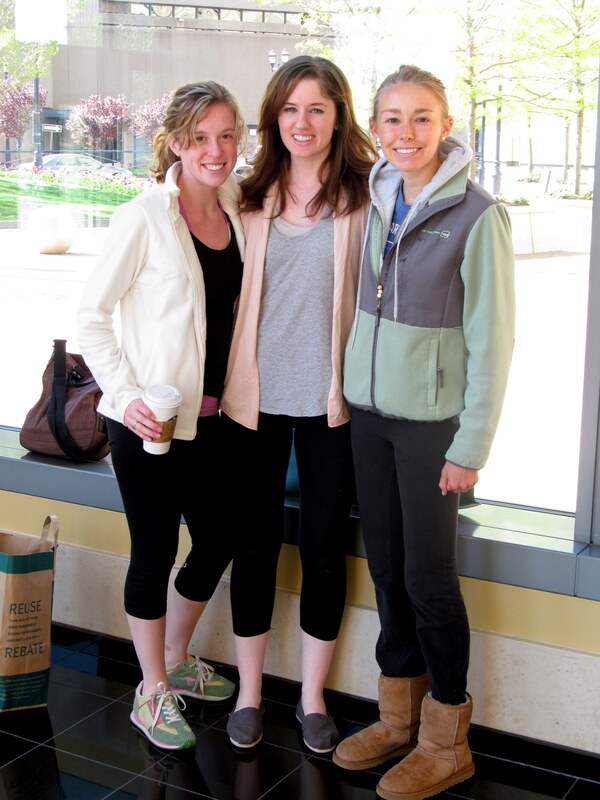 Erica, Bethany, and I also got to enjoy a free yoga class – they were running every hour on the hour! I had gone to Step that morning and my quads were sore from doing leg-heavy workouts the couple days before that, so the yoga felt good, and it was another great way to give free access to an activity that many may have been unfamiliar with, averse to trying, or doubtful of. Yay yoga! 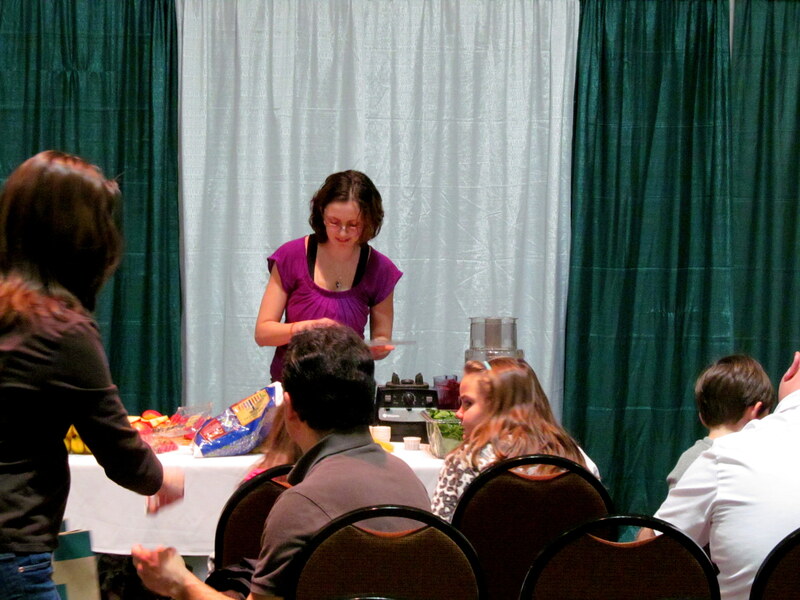 Lots of speakers and cooking demos going on too, including a Smoothie Workshop for kiddos! Whole Foods kids smoothie demo. Now, let’s get to the products! 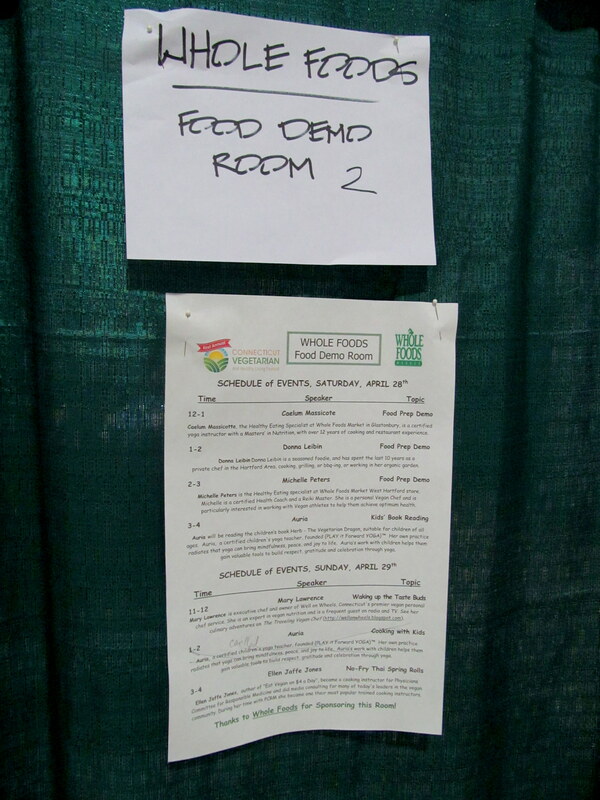 I love that this event gave so many passionate vendors the chance to get the word out about the foods they have worked so hard to create. All that many of them want is shelf space at a grocery store – it seems like little to ask for, but shelf space is actually VERY scarce with all the big corporations out there (and their big wallets) – getting even a little bit of shelf space is a BIG deal. 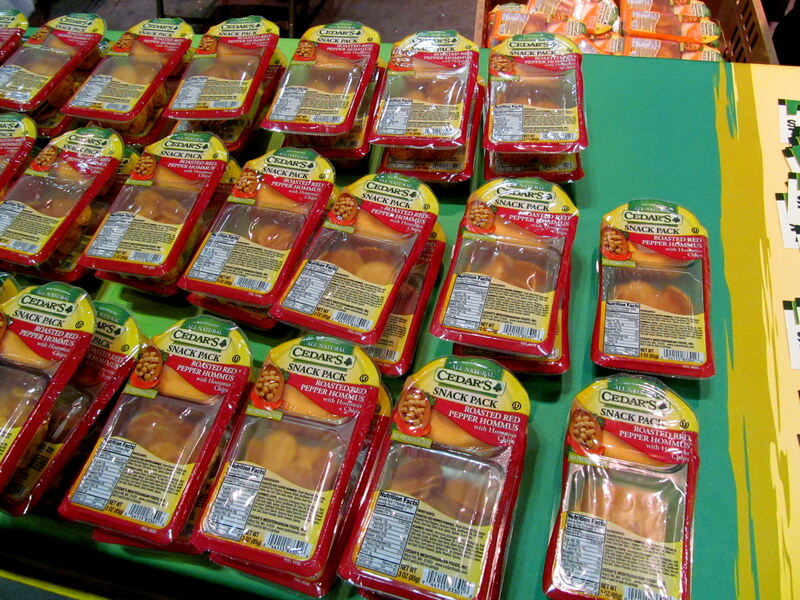 If you ever attend one of these kinds of events and try a product you love, suggest to your grocery store that they start carrying it – it often takes the voice of the people to convince a store that they should stock a product, because of course they exist to make money, and want to be positive it will sell. I don’t use dressings on my salads at home (I find that I really don’t need it at all, since my beasts include about 10-15 ingredients on average, many liquid-based, and “marinate” in my fridge overnight) but if I did, I’d be all about purchasing one of the above bottles of Wholesome Creations salad dressings. The green tea and ginger dressing on a cup of greens blew me away. Mama Micki’s was sold out of all three varieties of their vegan cookies by noon – a good sign for this all-natural bakery that is trying to get into stores! 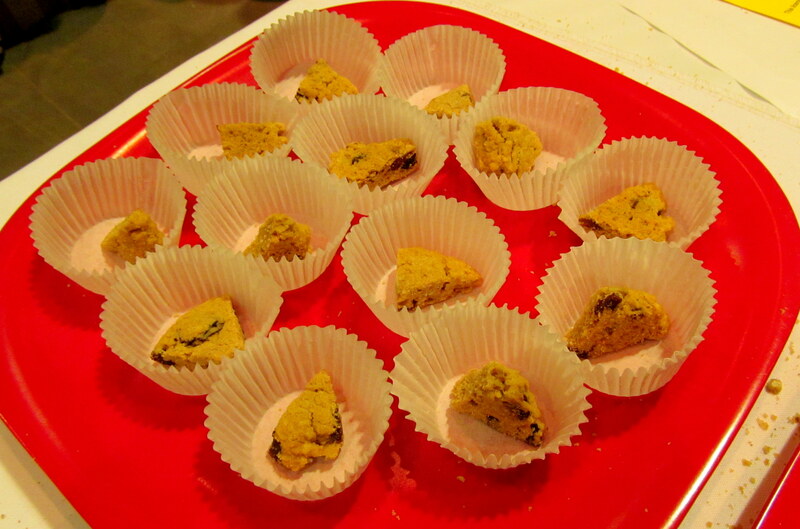 I sampled all three varieties – molasses, chocolate orange walnut, and oatmeal raisin sunflower seed (pictured above). I’m a sucker for a good molasses cookie, but have to declare the chocolate orange walnut the winner for its unique, complex flavor. 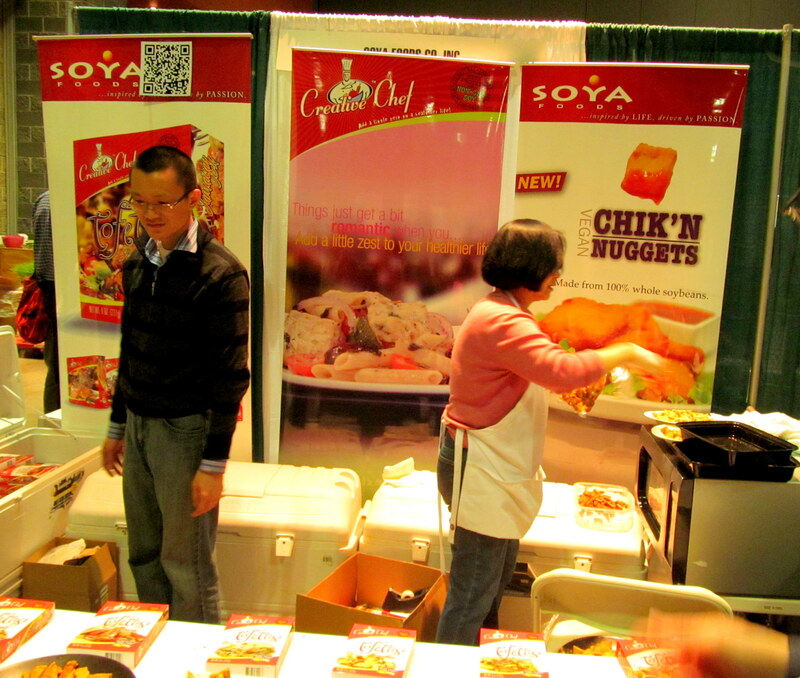 Soya Foods of MA had a generous amount of flavors of their Creative Chef Tofettis for patrons to sample – all of these are made with non-GMO soybeans! I tried BBQ, Brazilian, Hot & Spicy, Lemon Garlic, Jamaican Jerk, Teriyaki, and a faux “chicken nugget” as well (not pictured). 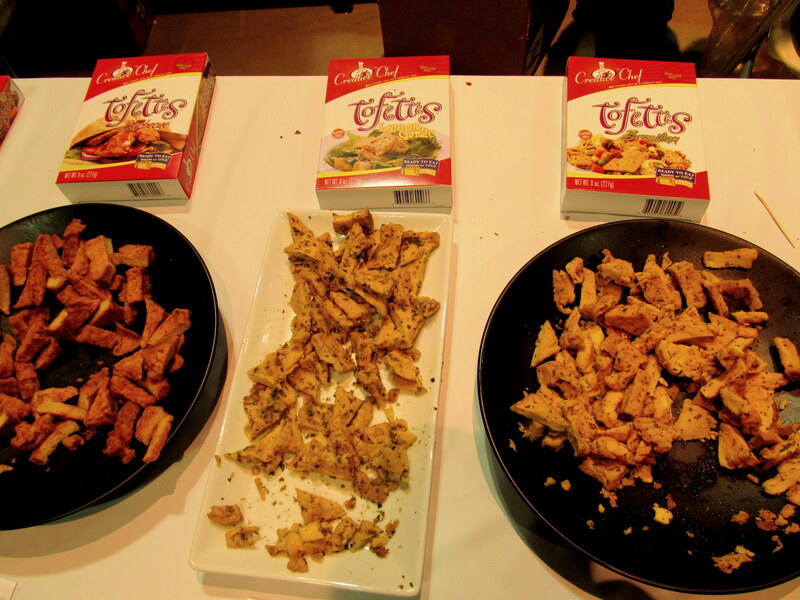 Seitan is a meat substitute I’d never had and I loved how it perfectly mimicked the texture and taste of ground beef. 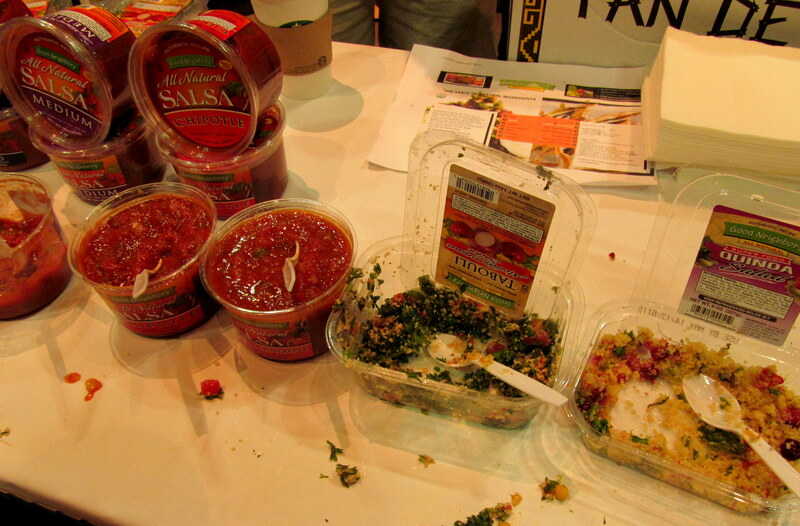 Upton’s Naturals of Chicago offered traditional, chorizo, and Italian varieties. I tried all three and especially loved the chorizo – it would go great in tacos or atop a big pile of nachos. 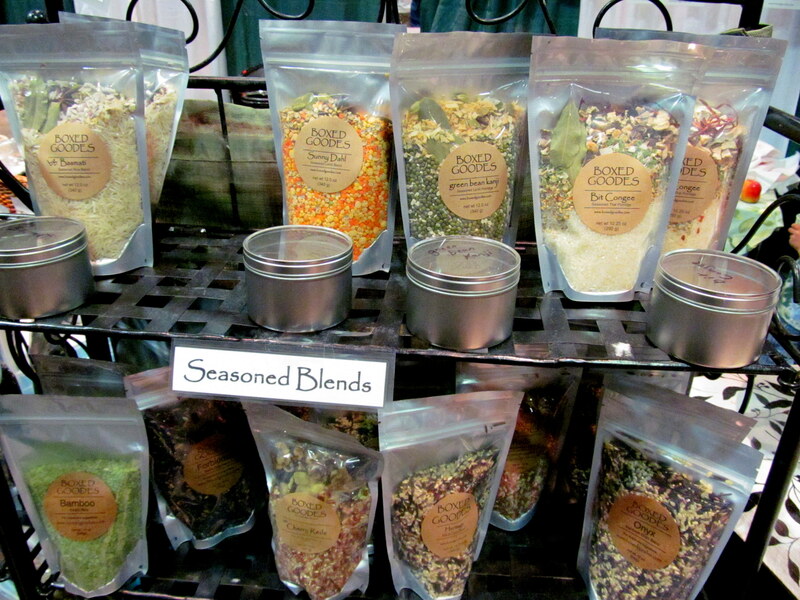 Bethany and I totally adored these Kathy’s Kitchen SuperSeedz. 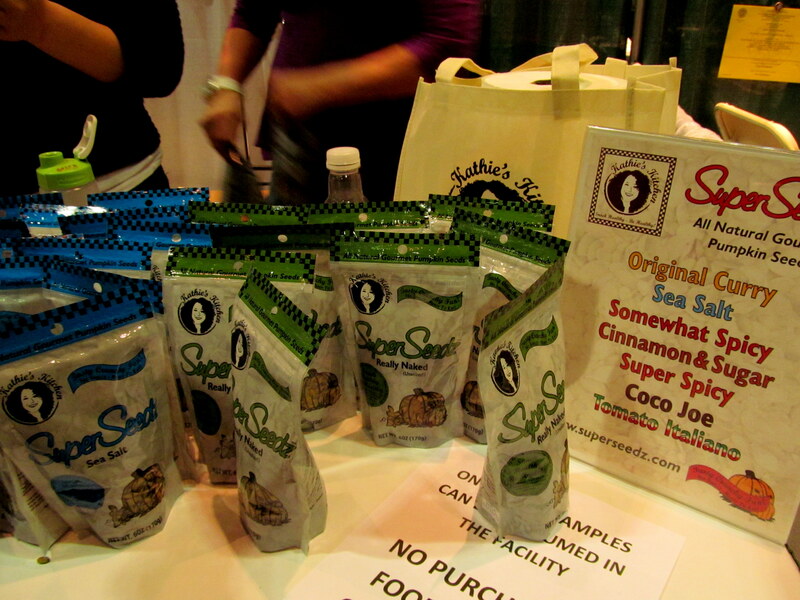 Kathy and her partner had plenty of flavors of these pumpkin seeds on hand, as you can see from the sign above! I sampled Original Curry, Coco Joe, and Cinnamon & Sugar. 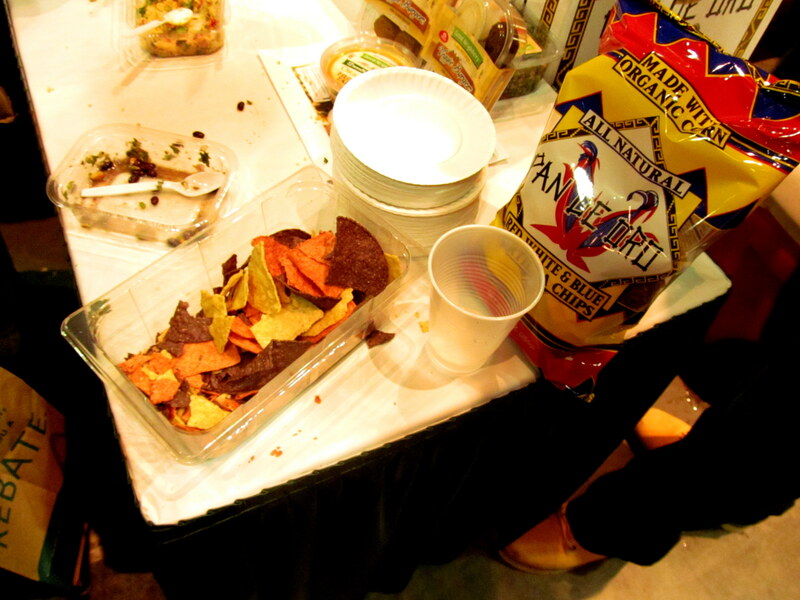 The Original Curry flavored seeds were awesome and the chocolate-y coffee flavor of the Coco Joe was perfectly balanced. 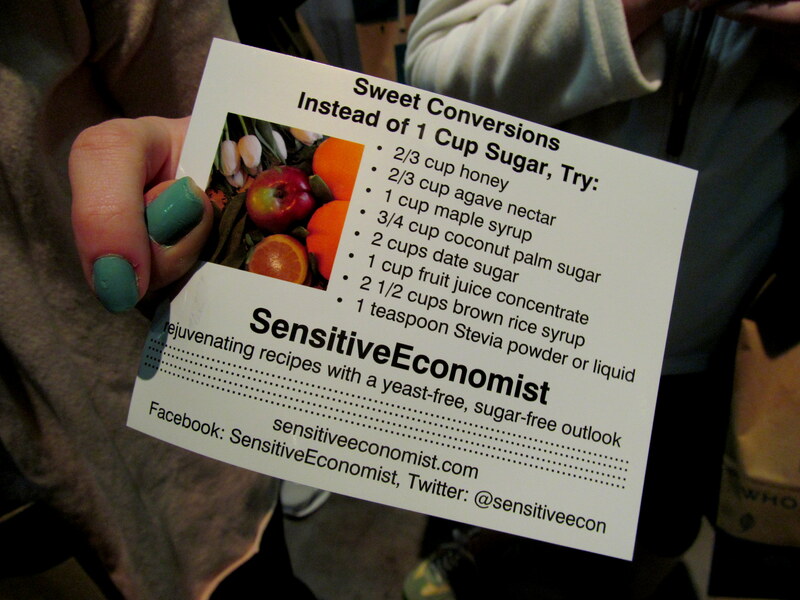 The Cinnamon & Sugar were good (can’t go wrong with that combo) but not nearly as remarkable as the first two flavors. 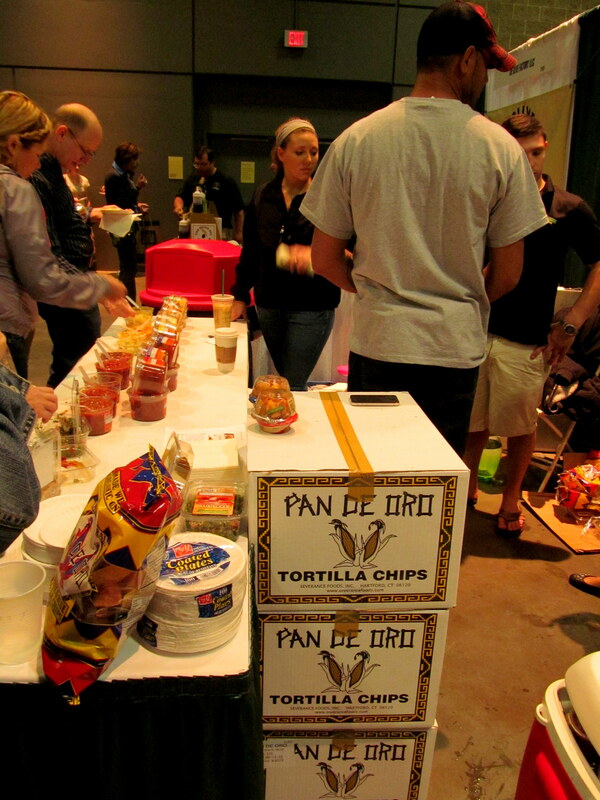 Local chip-makers Pan de Oro of Hartford (I sent a bag to Diana for foodie pen pals this month) partnered up with Good Neighbors of NH (love that) and provided a carb-tastic vehicle for sampling of salsas, salads, and hummus. I’ve bought Good Neighbors black bean spread before at Whole Foods and it was awesome. I didn’t know they sold falafel too – or as they call them, veggie burgers? 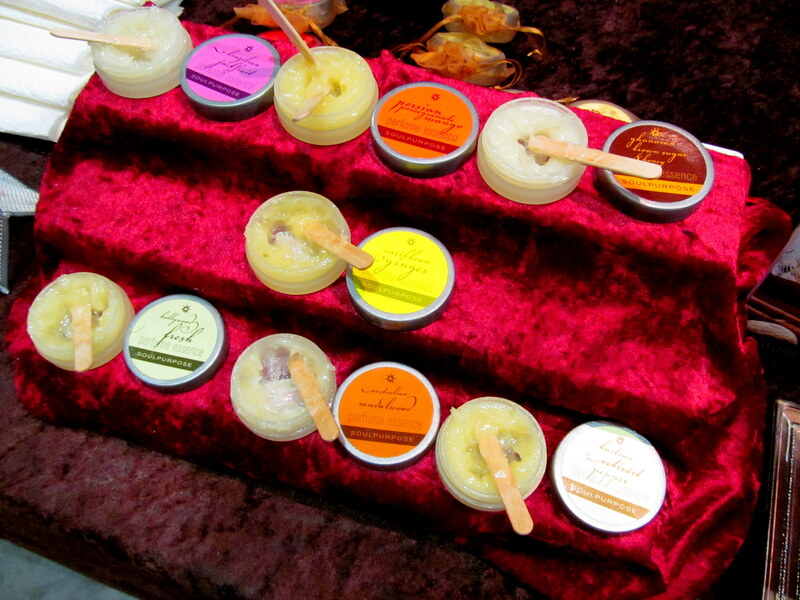 Check out the cute snack pack offerings as well! 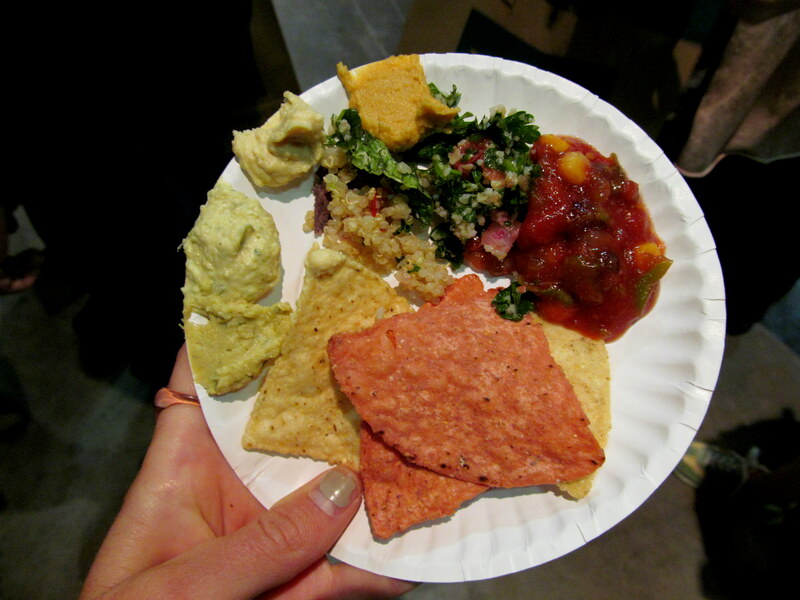 Love me some tabouli! I may be one of the few bloggers who can take or leave quinoa but it was still tasty. 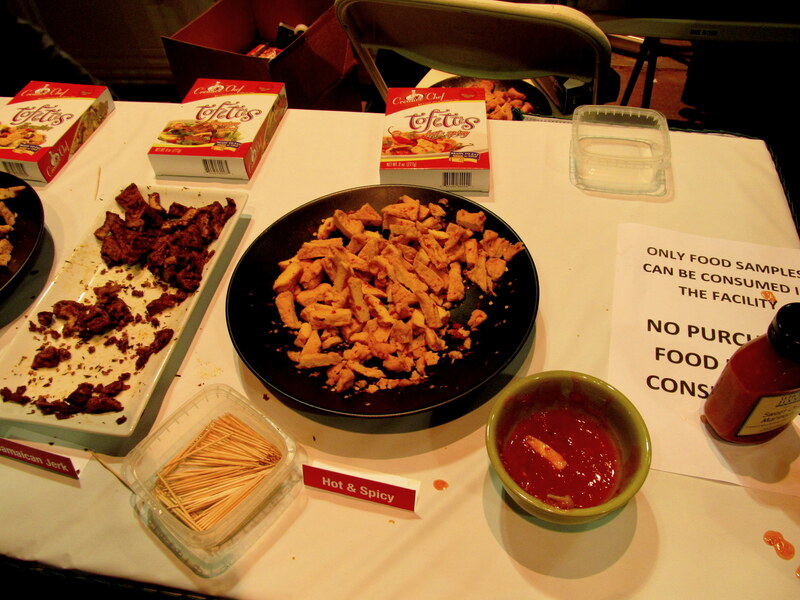 And LOTS of salsa choices, hand it over! Oh geez, where do I begin?! 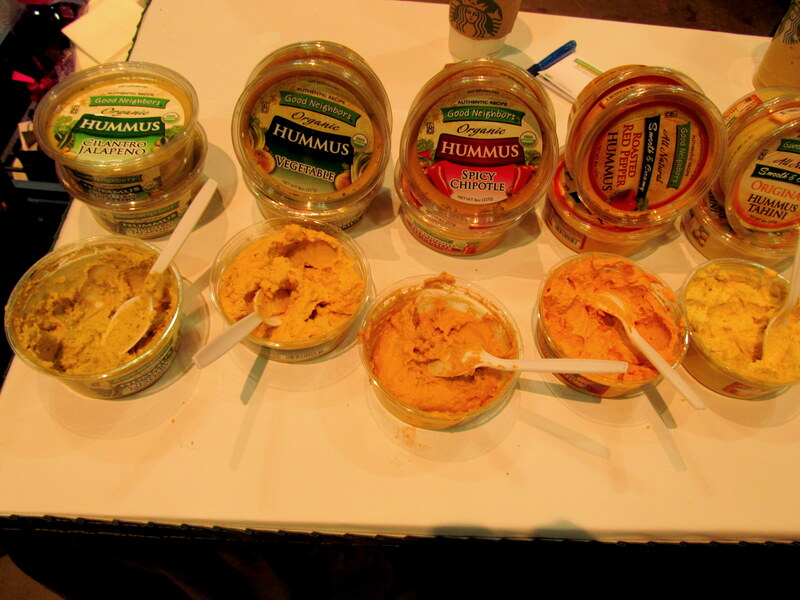 I wish I hadn’t downed my hummus samples so quickly because I honestly didn’t taste a huge difference between the flavors I tried (cilantro jalapeno, spicy chipotle, a couple others I can’t recall). However, the flavor I tasted was certainly delightful. 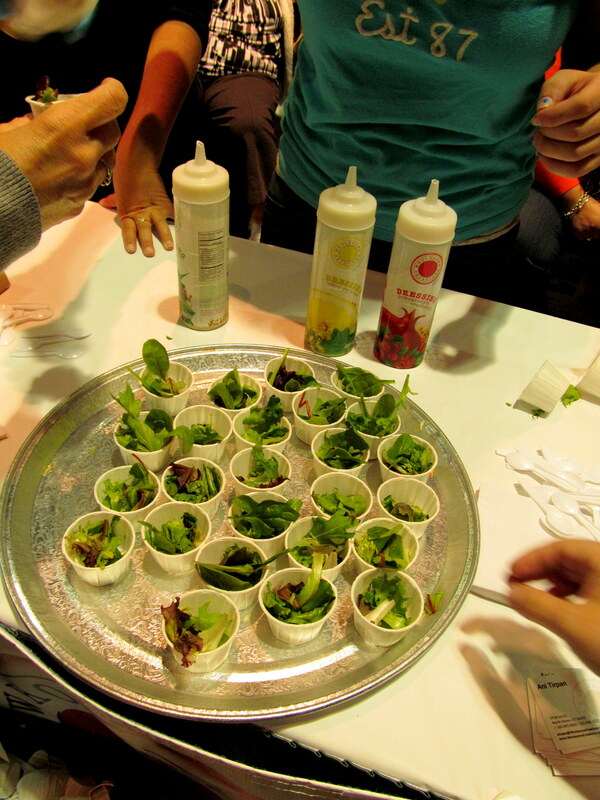 CT Veg Fest = free lunch! 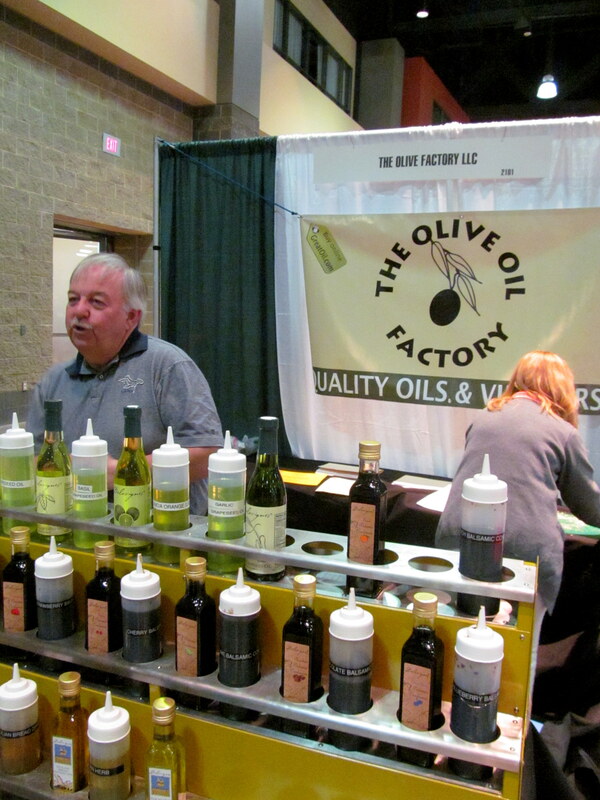 One of my favorite products of the day came from The Olive Oil Factory of Waterbury. 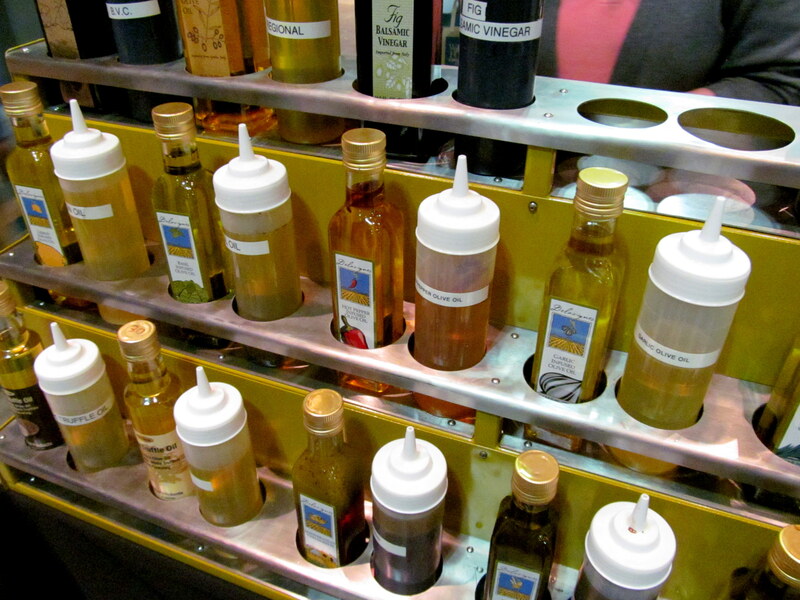 Gourmet olive oils and balsamic vinegar seem to be “all the rage” now, and I’m certainly glad because that means more and more unique varieties are coming out. I opted to receive my samples on vegan brown rice bread in the spirit of Veg Fest, but a non-vegan bread was also available. 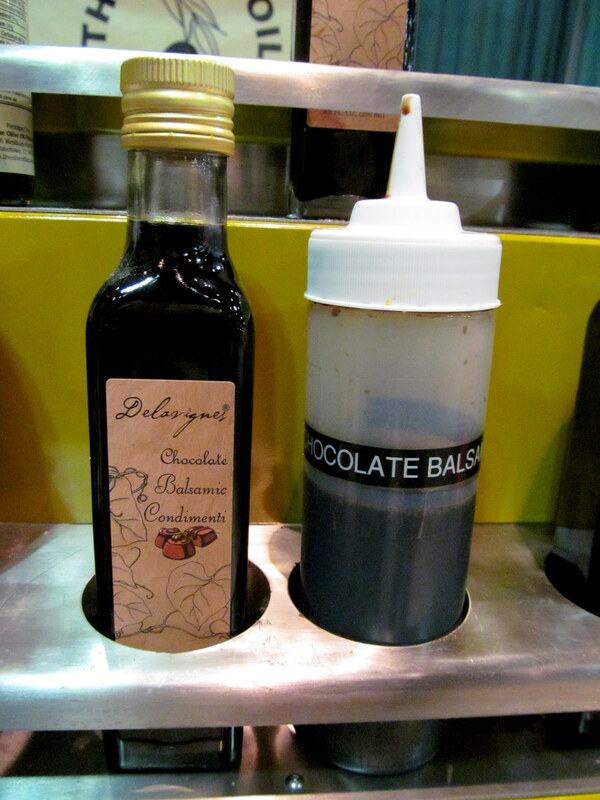 I started with the below chocolate balsamic – it blew me away! Holy crap. I just wanted to drizzle it (or pour it…) over a mound of fresh strawberries. I also tried blueberry, lime, and peach balsamic. All were so, so fantastic. The blueberry balsamic drizzled on a scone or muffin would seriously be the perfect weekend breakfast. Another favorite of the day? 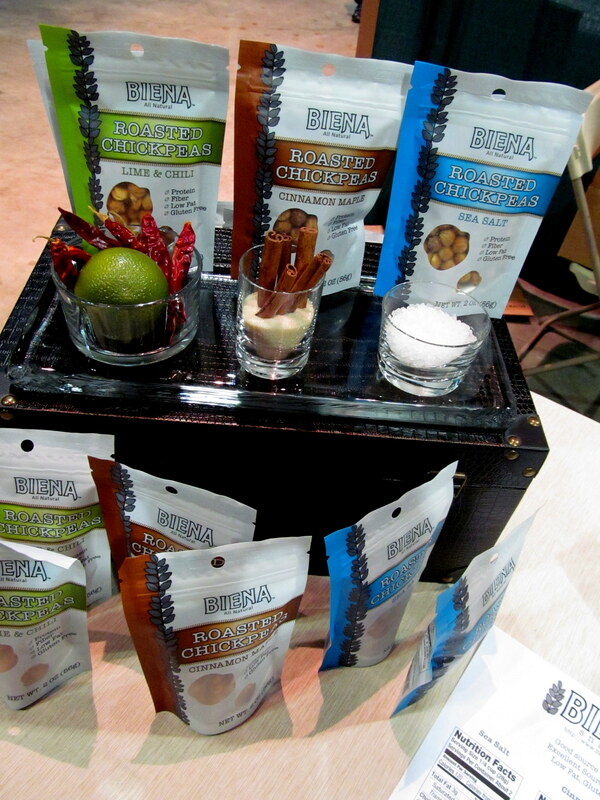 Boston-based Biena Snacks Roasted Chickpeas! These have plain-Greek-yogurt-mix-in written ALL over them. The Sea Salt flavor was good but compared to the other two, Lime & Chili and Cinnamon Maple, it was just blah. That’s because the other two flavors were so amazing! I’ve always wanted to try roasted chickpeas and am glad I finally was able to. 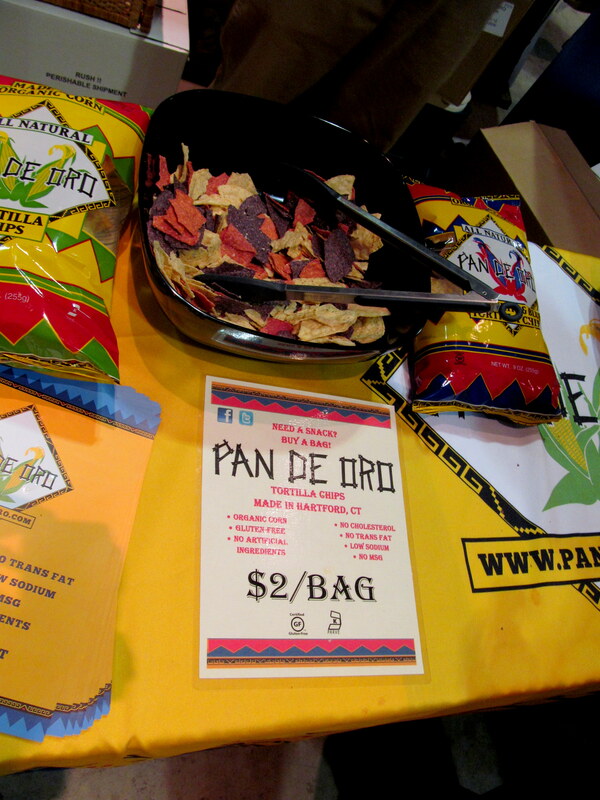 Pan de Oro had their own booth of course, but by the time I got there they had run out of all their new varieties of chips (I missed out on the GARLIC!!!). I still wasted no time in sampling the original flavor. Erica had stopped by earlier than me and purchased two bags of the garlic chips! 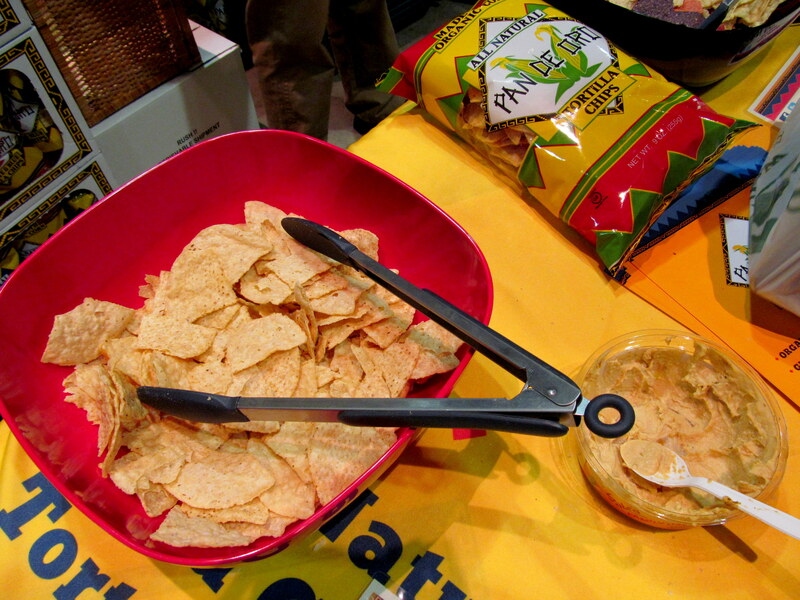 They were kind enough to sell their chips at a discounted price at the event (many vendors were doing this). 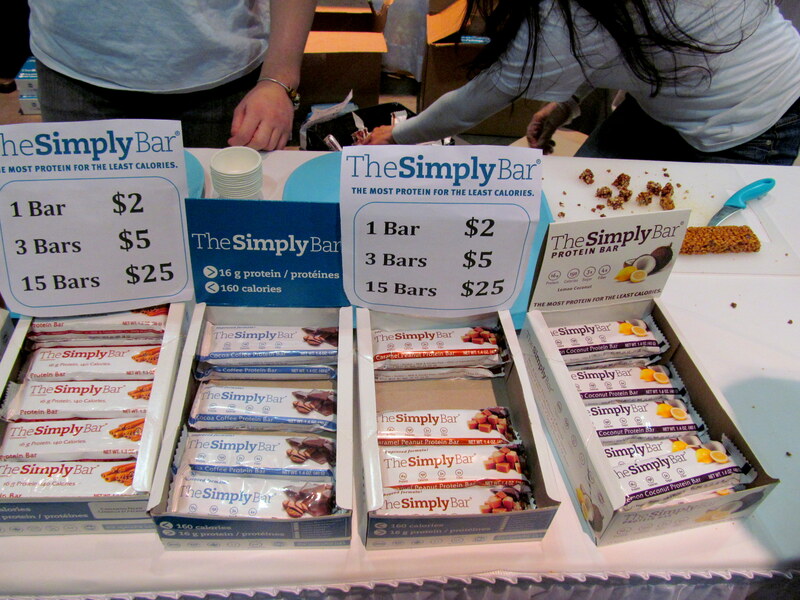 The Simply Bar is probably the most impressive bar I’ve ever seen, from a nutritional stats standpoint. I tried the Cocoa Coffee, which contains real caffeine, and enjoyed its taste as well! These bars are VERY low in sugar and saturated fat, unlike most bars I’ve seen, which remind me of candy bars. Being a long-time blog reader, I’ve seen Sun Warrior and Vega proteins all over the place. I’ve never been that interested in protein powder though, so have never bought any. 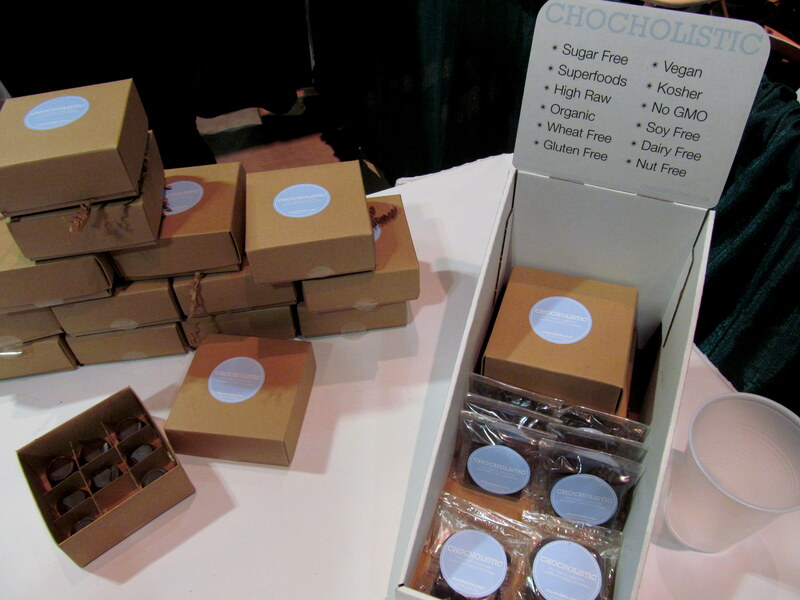 Perfect opportunity to sample some – expertly prepared by VeganProteins.com! 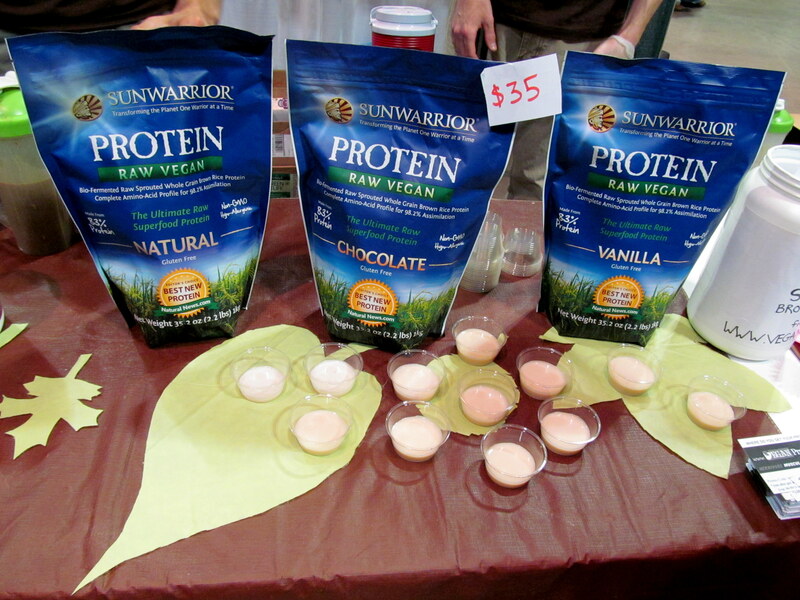 I liked the vanilla Sun Warrior protein shake! The desire to drink any more than a few sips, though, was not there. 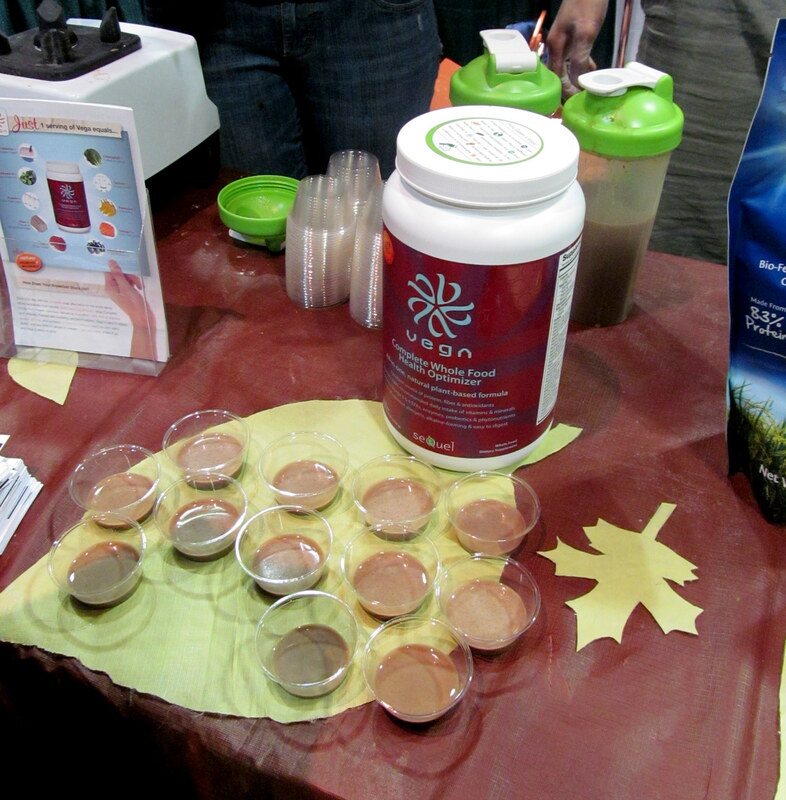 And I had no desire to drink another sip again of the chocolate Vega protein shake. Sorry – not for me! 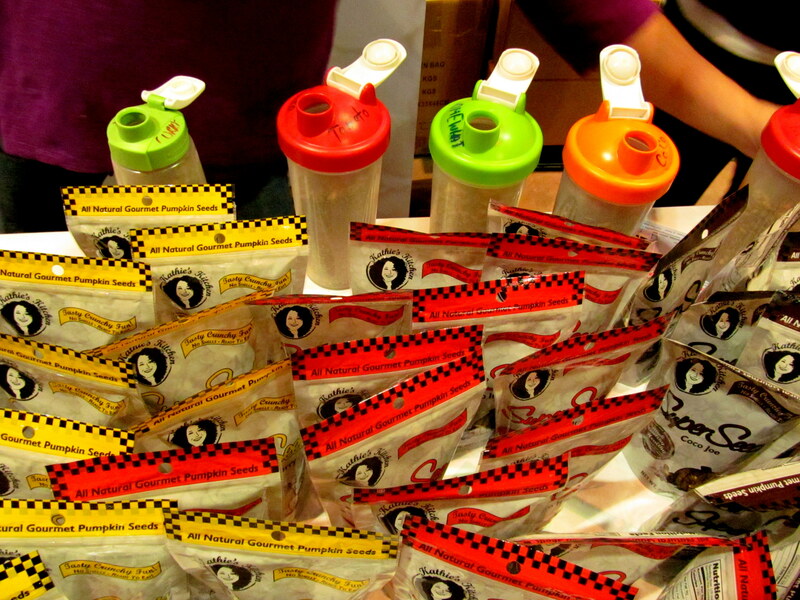 However, I know that protein powders are something that is enjoyed by many a blogger and blog reader, and it’s great that there are so many vegan options. 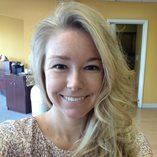 My twin Heather is a huge Vega fan and uses their powder to make protein pudding oats almost every day! 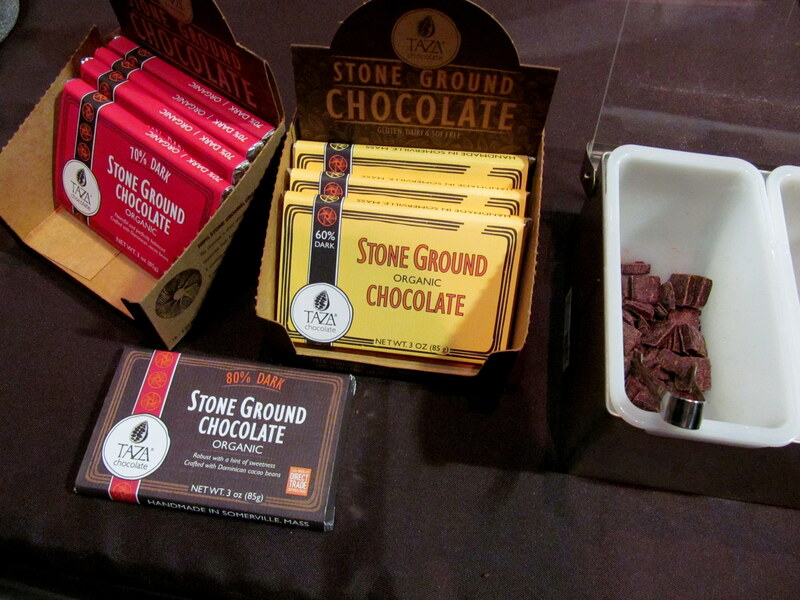 The Taza chocolate above had an amazing flavor different from any chocolate I’ve ever tried, because it is made from stone-ground cacao nibs. Due to the manufacturing process, the cacao nibs are not completely ground up, which leaves a lot of the cacao flavor in the bars. It’s very complex and hearty. 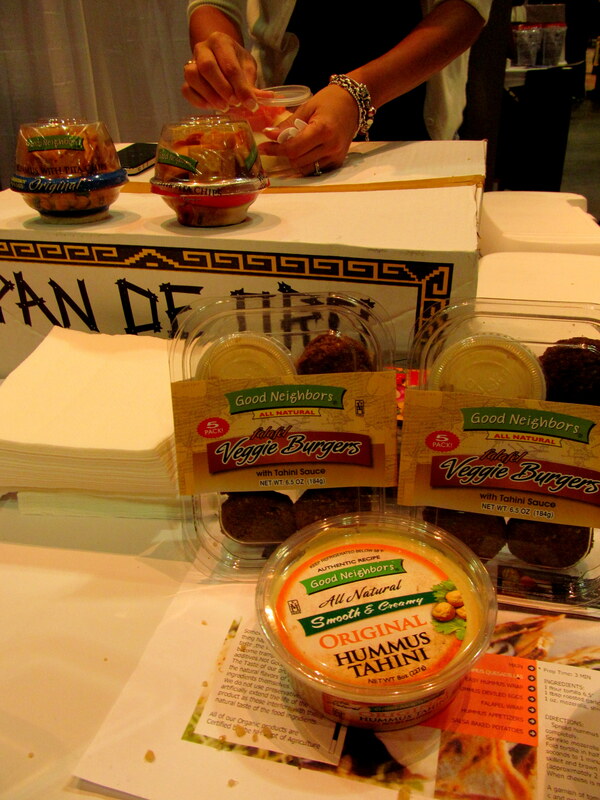 Cedar’s is the hummus brand of choice in my house and they passed out a ton of these nifty snack packs! Can’t wait to munch on mine. Coconut butter is another product that’s been very popular in the blog world, but I hadn’t been able to try it until now. Nature’s Approved had the great idea of serving it up with a dallop of chocolate atop a graham cracker – just as good as any s’more! Well OK, maybe not, because there’s nothing like a charred-to-a-crisp marshmallow. But this was darn close. 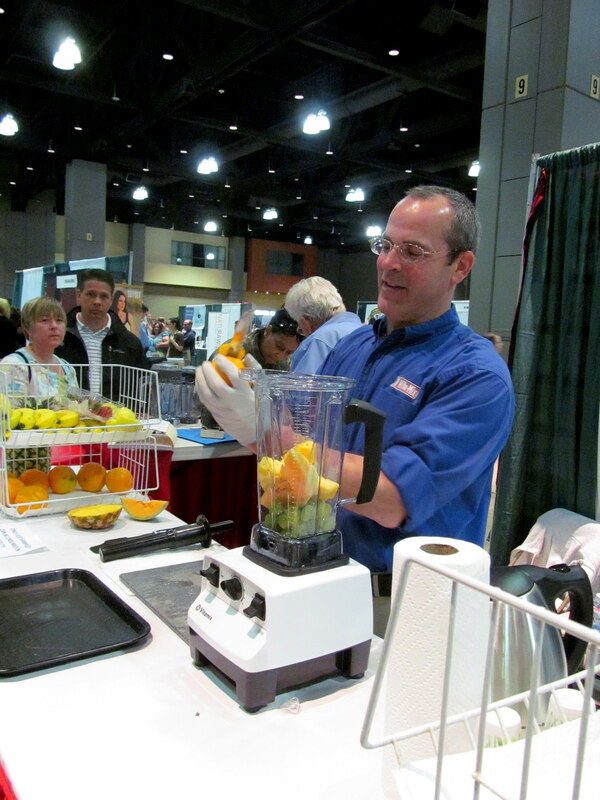 Of course Vitamix was there, because it’s not a food event without Vitamix!! 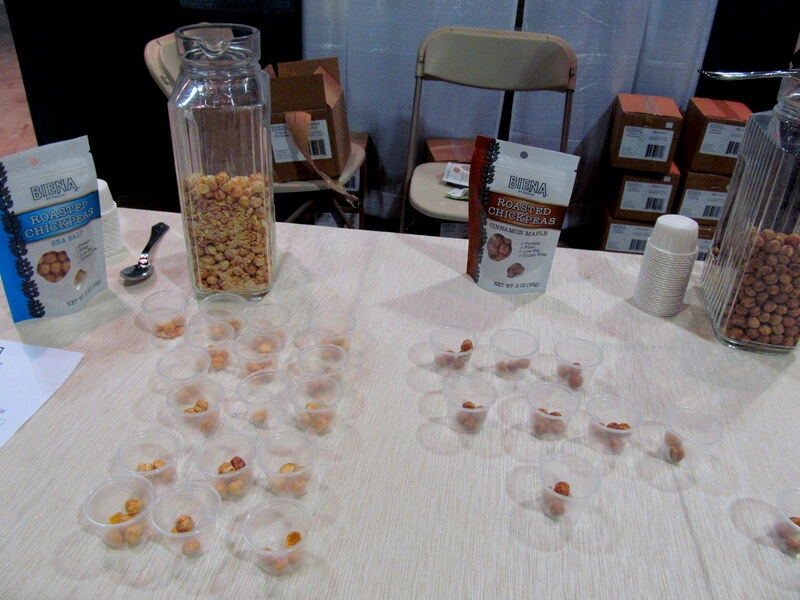 I sampled a handful of freeze-dried corn from Raw Foods Central. It was really good – nice and sweet. 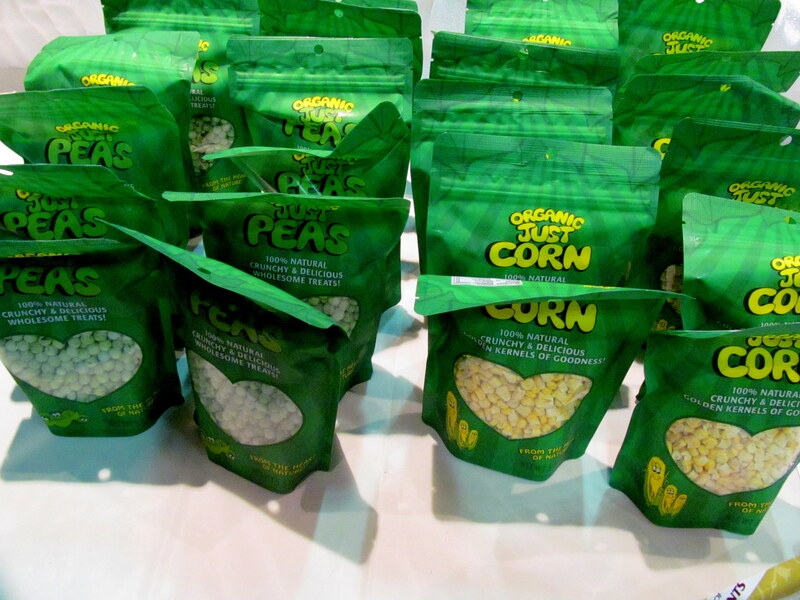 I wonder how the peas would taste! 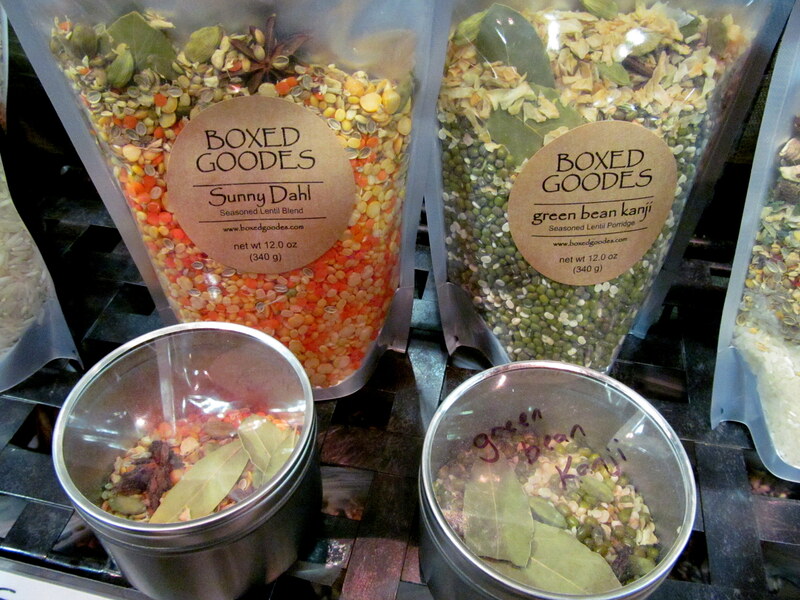 Litchfield based Boxed Goodes Pantry served their herb dips with fresh-cut bread. Not only did they taste delicious, but the packaging was so gorgeous and colorful. A set of jars in a kitchen filled with these herbs would really brighten up the place. What a FUN event! 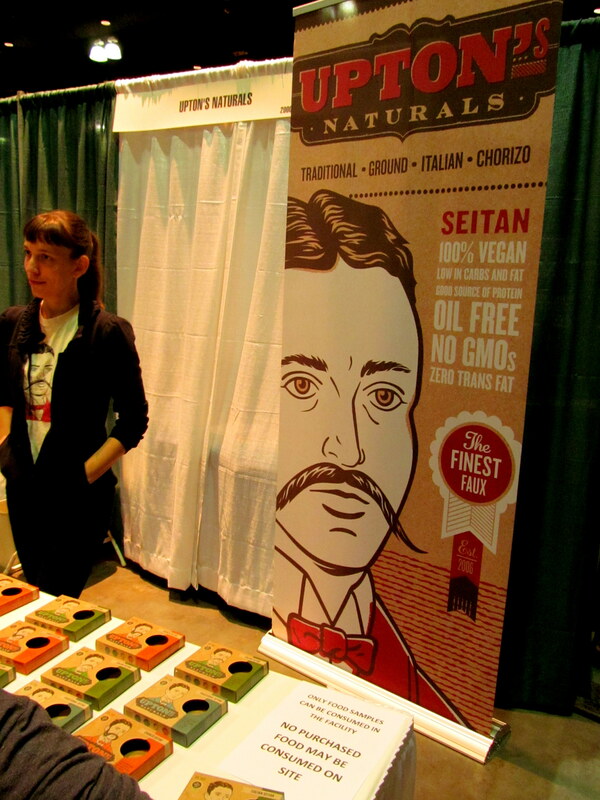 Bethany and I are heading to Wesleyan University this weekend to attend 2012 Foodstock next. 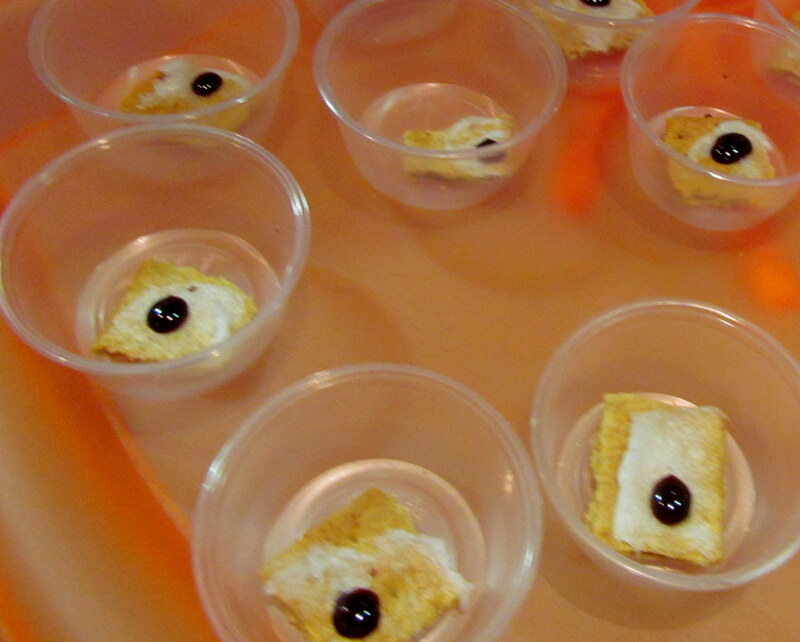 Loving all these FOODIE conferences! 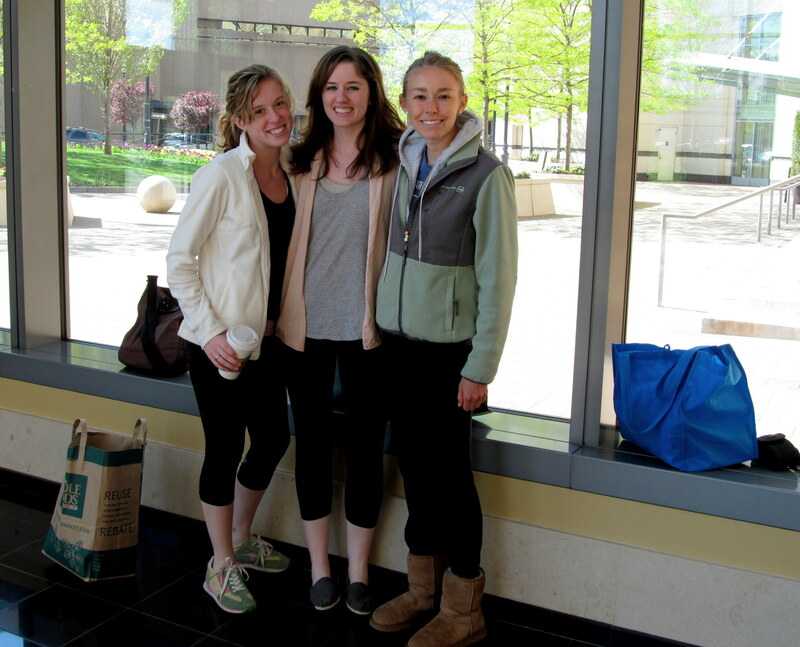 Clearly we were prepared to get our yoga on! 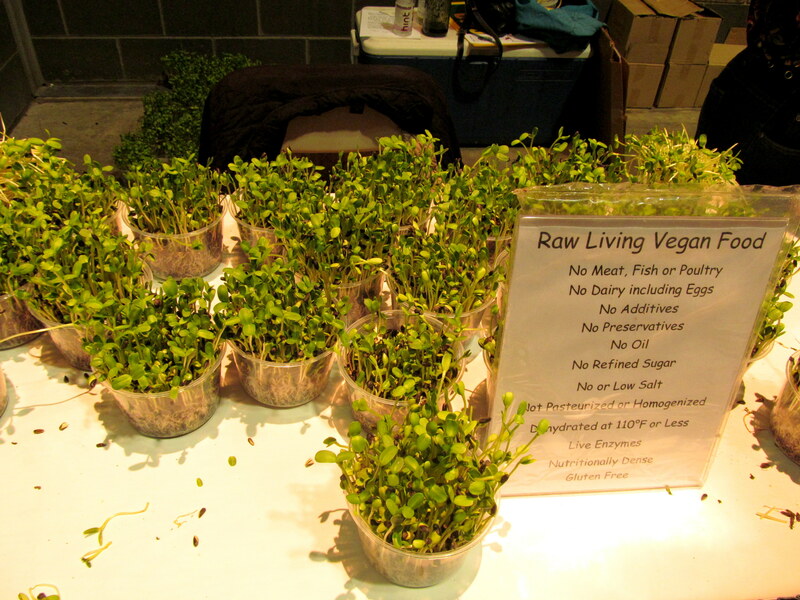 Have you ever been to a vegetarian and/or healthy living festival? 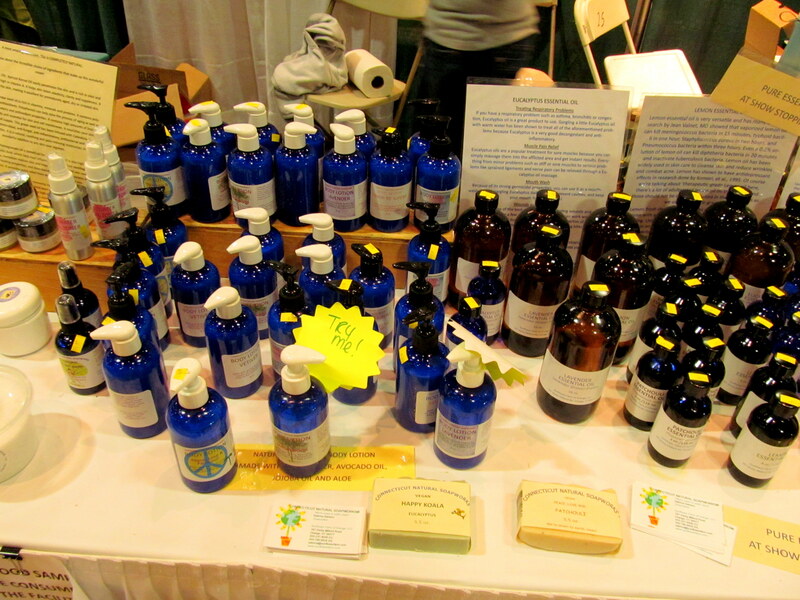 Have you ever tried any of the products I sampled?